Iran’s constitution vests ultimate authority in the supreme leader, but the presidency has developed into a powerful office. The last four presidents have each stamped his own personality and politics on social and economic life, domestic politics and foreign policy. Powerful presidents have also aroused powerful opposition. Presidential administrations have been characterized by factionalism between the president’s party and his opponents. They have also been driven by tension over authority between the president and the supreme leader. So far, the leader has emerged the dominant authority in these confrontations. The presidency of Mahmoud Ahmadinejad initially seemed a departure from the past, as he sought to build up a power base among the same constituencies in the military, judiciary and security agencies that are the supreme leader’s base of support. However, he did not succeed. Ahmadinejad’s clash with Khamenei over a matter of appointments made clear the ultimate loyalty of these agencies was to the leader, not the president. 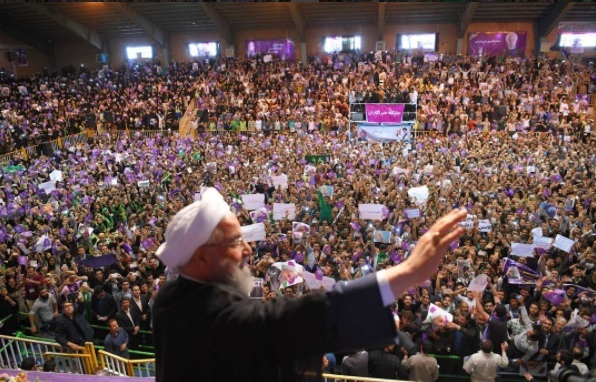 Hassan Rouhani’s election in 2013 underlined again the preference of a majority of Iranians for moderation at home and reduction of friction with the West abroad. The signal achievement of his first two years in office was the agreement with the major powers over Iran’s nuclear program, the Joint Comprehensive Plan of Action (JCPOA). However, tensions with the West over other aspects of Iran’s foreign policy continued; and at home Rouhani secured some easing of social and political restrictions but proved unable to break the repressive hold on political life of the judiciary and the security agencies. Rouhani’s second term was dominated by the consequences of the Trump administration withdrawal from the JCPOA; the reimposition of wide-ranging U.S. sanctions and the severe damage they caused to the Iranian economy; rising tensions with the Arab states of the Persian Gulf and with Israel; and a growing role for the Revolutionary Guards in matters of internal security and repression. The Islamic Republic’s initial constitution provided for a president with limited powers and a prime minister as head of the cabinet and government. The first president, Abolhassan Bani-Sadr, sought control of the government apparatus. But he faced fierce opposition from the clerical party, even as he dealt with revolutionary turmoil, the American hostage crisis and the Iran-Iraq War. He was impeached during his second year in office. Under Ayatollah Ali Khamenei, the president took a back seat to the prime minister. Constitutional amendments in 1989 abolished the prime minister’s post, creating a presidential system. The four presidents that followed each put his own distinct mark on the country. Akbar Hashemi Rafsanjani moved foreign, economic and social policy in a more pragmatic direction. But in his second term, he lost the initiative to the supreme leader and conservatives. Mohammad Khatami launched a period of unprecedented political liberalization. But he was similarly thwarted by opposition from the hardliners and the leader’s office. Mahmoud Ahmadinejad came to office as a populist and seemed to be building up a base of support in the security and military services independent of the supreme leader, even though he initially enjoyed the leader’s warm support. However, this support base proved a passing phenomenon. When disagreements between the president and Khamenei surfaced, the ultimate loyalty of these organizations remained with the leader. Hassan Rouhani, at least into the second year of his first term in office, won Khamenei’s cautious support for his attempt to address international concerns with Iran’s nuclear program. But major decisions on other issues of foreign policy and over the security agencies, the judiciary and the Revolutionary Guards remained with the leader. Abolhassan Bani-Sadr was one of the anti-shah exiles who returned to Iran on the eve of the monarchy’s ouster. He was elected the first president of the Islamic Republic and took office in January 1980. He owed his electoral success to close ties to revolutionary leader Ayatollah Ruhollah Khomeini, visibility gained from books and essays on Islamic government and economics, and a prominent role as the architect of the sweeping nationalizations of private industries, banks and insurance companies that immediately followed the revolution. His presidency was marked by an intense rivalry over policy and power between his camp and the clerical group around Khomeini, led by Ayatollah Mohammad Beheshti and the Islamic Republic Party (IRP). The IRP-dominated Majles, or parliament, frustrated Bani-Sadr’s agenda and pushed its own program. The government was paralyzed for months in a stand-off over cabinet appointments between the president and new prime minister, Mohammad Raja’i, a Beheshti protégé. Bani-Sadr wanted to dismantle or at least curb the unruly revolutionary committees and revolutionary courts. The clerical party supported these institutions. The rivalry was further fueled by the 444-day American hostage crisis and the Iran-Iraq War. Bani-Sadr sought the release of the American diplomats seized when the U.S. Embassy was over-run by militant students in November 1979. His clerical rivals used the embassy seizure to deepen the radical temper of the revolution. In the war with Iraq, Bani-Sadr championed the regular army and conventional military strategy. The clerics championed the Revolutionary Guards and “revolutionary” defense. Bani-Sadr initially enjoyed strong support from Khomeini, who endorsed the president’s call for a return to normalcy and an end to revolutionary turmoil. He allowed Bani-Sadr to name the national broadcasting chief and assume his authority as commander-in-chief. But when Khomeini’s attempts to mediate between the president and his IRP rivals failed, he sided with the clerical camp and allowed Bani-Sadr’s impeachment. In mid-1981, the Majles voted 177-1 (with 33 absent or abstaining) to oust him. Bani-Sadr, in hiding, escaped into exile. Mohammad Ali Raja’i succeeded Bani-Sadr in a hastily-organized and barely-contested election in July 1981. He took the oath of office on August 2, but he was assassinated on August 30. He was succeeded by Ali Khamenei in another largely uncontested ballot held in October. Khamenei’s selection reversed an informal Khomeini dictum that clerics should not assume the presidency. One of the founders of the IRP, Khamenei had served briefly as supervisor of the Revolutionary Guards and also as minister of defense. Khamenei served two four-year terms as president, but was over-shadowed by Prime Minister Mir Hossein Mousavi who steered the country through the difficult years of the Iran-Iraq War. Khomeini even publicly and sharply reprimanded Khamenei in January 1988, when the president dared to suggest that the constitution placed limits on the authority of the state and parliament in the economic sphere. Khamenei’s presidency was marked by the brutal suppression of the radical opposition parties between 1981 and 1983, when thousands of young men and women were jailed and killed, often in the streets; by the marginalization of the centrist opposition parties; and by the murder in prison of over 2,000 members of the radical left-wing groups at the end of the Iran-Iraq War. In other spheres, Khamenei was indentified with the ‘moderate’ rather than the radical wing of clerics in Khomeini’s inner circle. He supported Rafsanjani’s controversial proposals to allow more scope for the private sector in the economy. After Khomeini’s death in 1989, Khamenei was selected as his successor, with the expectation that he would be a relatively pliant supreme leader. Rafsanjani was inaugurated in July 1989, at a watershed moment. Khomeini had died in June and his lieutenants were now in charge. The Iran-Iraq War was over, permitting Tehran to begin the post-war reconstruction. After Khomeini’s death, the constitution was amended to eliminate the post of prime minister and vest his powers in the president. In the post-Khomeini period, Rafsanjani was the dominant figure in the two-man team of president and supreme leader that ran the Islamic Republic. Khatami was the dark-horse winner of the 1997 presidential election. He galvanized voters by emphasizing the rule of law, respect for rights, tolerance for diverse views, special attention to the needs of women and youth, and an opening to the outside world. Khatami won 70 percent of the vote—in an 80 percent turnout. He won a second term in 2001 by a similar margin. The Khatami era ushered in political openings not experienced since the revolution’s early months. The culture and interior ministries granted licenses allowing the emergence of a vigorous press and professional, civic and political associations. Khatami forced two intelligence ministers to resign and curbed some of the ministry’s excesses. Elections for local councils—promised in the constitution but never held—were conducted for the first time. Economically, the sharp drop in oil prices that coincided with Khatami’s election restricted government spending and investment opportunities. His aides were also initially divided between economic liberalization and state control. But by Khatami’s second term, differences had been ironed out in favor of economic liberalization. The government simplified the tax code and import regulations, unified exchange rates, and allowed private banks and insurance companies for the first time since the revolution. A considerable portion of oil revenues was set aside in a reserve fund for investment and as a cushion for difficult times. Privatization of state-owned industries was resumed. In foreign policy, Khatami adopted language to end Iran’s opposition to Israel’s existence and the Arab-Israeli peace process. In a CNN interview, he called for a dialogue between the Iranian and American people, a possible prelude to government talks. He boldly nullified Khomeini’s death decree against writer Salman Rushdie, removing a major obstacle to economic and diplomatic relations with Europe. He agreed to suspend Iran’s nuclear fuel enrichment program to allow negotiations with the Europeans to go forward. From the beginning, hardliners in the security services, the Revolutionary Guards, the supreme leader’s office and parliament sought to undercut Khatami’s political liberalization. Several reformist newspapers were closed down. Tehran Mayor Gholam Hossein Karbaschi, who helped engineer Khatami’s victory, was tried on trumped-up charges of corruption. He was sentenced to two years in prison and barred from public office for 10 years. Parliament forced Interior Minister Abdollah Nouri out of office and the judiciary imprisoned him after he started a popular newspaper. Khatami’s chief political strategist and adviser, Sa’id Hajjarian, barely survived an assassination attempt that left him disabled. Khamenei undercut Khatami’s overture to America and softer tone on Israel. During Khatami’s first term, the reform movement survived attempts to derail it. In 2000, voters gave a loose coalition of parties closely associated with Khatami a working majority in parliamentary elections. But the vote proved to be the turning point. Reformists called for changes hardliners found threatening: a liberal press law, an independent judiciary, a ban on Revolutionary Guards’ involvement in the economy, parliamentary oversight of the intelligence ministry and national broadcasting and limits on the supreme leader’s wide powers. In a 10-week period, the judiciary closed over 20 publications, virtually shutting down the reformist press. The Guardian Council, a constitutional watch-dog body, barred parliamentary oversight of organizations that came under the supreme leader—the judiciary, the military and national radio and television. The supreme leader prevented parliament from passing a more liberal press law. Journalists and intellectuals were again arrested and jailed. Khatami seemed helpless to protect them. His silence then—and when security forces and thugs beat up protesting students at Tehran University in 1999—were indicators that he had lost the initiative. Control had passed to the hardliners. Ahmadinejad, the mayor of Tehran and a former provincial governor, was elected president in 2005 after a run-off vote against Rafsanjani. He campaigned as champion of the “little man” against the old establishment. His humble life-style contrasted sharply with Rafsanjani’s wealth. Revolutionary Guards and paramilitary forces mobilized voters for Ahmadinejad, while many young and middle class voters, disappointed at the failure of reform, stayed home. A populist in style and substance, Ahmadinejad distributed largesse to the poor and lower middle class in the form of marriage and housing assistance. His presidency coincided with high oil prices. Oil revenue during his eight years in office came to nearly $700 billion, but was largely wasted on short-term, non-productive programs. He set aside 40 per cent of shares in privatized enterprises for sale to low-income groups at subsidized prices, but the bulk of these shares were snapped up by para-statal organizations and foundations. He coerced state-owned commercial banks to direct loans at low-interest rates to preferred geographic areas, small enterprises, and favored organizations, such as the Revolutionary Guards. The principal result, however, favored the rich and severely burdened the banks with non-performing loans. A liberal import policy flooded the market with cheap Indian and Chinese goods but hurt domestic industries and used up foreign exchange which might have been put to more productive use. The centerpiece of his economic agenda was a reform of the costly government program that subsidized the price of gasoline, kerosene, electricity and basic goods. He secured Majles approval for a bill that would gradually raise the prices for these goods and services to near-cost or near-market levels. At the same time, part of the additional government income would be used to cushion families with a monthly subsidy of roughly $45 (at the then prevailing exchange rate) to every individual Iranian. Industries would also receive assistance to help pay for higher fuel and electricity costs. The program initially was hailed as a success; gasoline prices almost doubled and electricity prices went up five times, but the country remained quiet. In practice, however, anticipated additional revenues fell far short of the monthly payments to individuals. Once in place, these subsidies proved politically difficult to rescind, imposing a further drain on government resources. Ahmadinejad removed many in the ruling establishment from office and named others from the armed services and bureaucratic middle ranks to the cabinet, ministries, government organizations, banks and even hospitals and universities. The result was a decline in competence in these institutions. He also raised hackles by ignoring established procedures, laws and regulations. He drew on the oil reserve fund for pet projects without consulting parliament. The Plan Organization, responsible for Iran’s five-year development plans, was abolished, as he considered long-term planning pointless. He stopped attending meetings of the Supreme Defense Council. Later in his two-term presidency, he named personal envoys on the Middle East, Afghanistan and elsewhere, bypassing the foreign ministry. Ahmadinejad’s presidency was marked by a sharp increase in the powers of the Revolutionary Guards and security agencies. He named many former Revolutionary Guard commanders to top posts and favored the Guards with huge, no-bid government contracts. By his second term, the Revolutionary Guards had become an economic powerhouse in the energy sector, armament manufacturing, contracting, electronics, automobile assembly and transportation. Guards commanders also began to interfere openly in political matters, and a security arm of the Guards felt free to make arrests of political dissidents. Upon taking office, Ahmadinejad named hardliners to head the ministries of culture, interior and intelligence. Press censorship and harassment of intellectuals sharply rose. In political coverage, state television became an instrument of the intelligence ministry. In foreign policy, Ahmadinejad adopted a truculent posture towards the international community. He called for the eradication of Israel and denied the Holocaust. He challenged America’s international dominance and called for a new world order. His government pushed ahead with its nuclear fuel enrichment program, despite new U.N. and U.S. sanctions between 2006 and 2010. Carefully nurtured relations with the Arab states suffered a setback when Iran embraced the Arab Spring uprisings and intensified its support for Syrian President Bashar al Assad in the face of internal unrest. In June 2009, Ahmadinejad won a second term in a widely disputed election that gave birth to the opposition Green Movement. Peaceful protests by hundreds of thousands in Tehran were put down brutally. Thousands were detained and more than 100 accused in a televised mass show trial. During Ahmadinejad’s second term, problems mounted for his government. Economic and banking sanctions imposed by the United States, the European Union and under U.N. Security Council resolutions (assisted by the government’s own mismanagement) severely dislocated the economy. Iran’s oil exports were halved. Iranian industries found it difficult to import raw materials and spare parts; Iranian banks found it difficult to conduct international transactions. In the second half of 2012, an initially moderate fall in the value of the rial accelerated; the rial eventually lost 66 percent of its value against the U.S. dollar. Ahmadinejad alienated Majles deputies by failing to implement legislation, undertaking pet projects without Majles approval and treating the deputies with contempt. He alienated members of the clergy with views on religion that, to them, smacked of heterodoxy. As long as the president enjoyed the support of the supreme leader, these resentments simmered below the surface. In April 2011, the president and Khamenei had a falling out over the selection of the minister of intelligence, whose appointment had come to be the supreme leader’s prerogative. The president’s open defiance of the supreme leader, even if temporary, permitted Ahmadinejad’s critics among the clergy and the political class to go public. The arrest or departure from office of several of the president’s aides followed. Ahmadinejad and his team came to be dubbed as the “deviationist current.” Several of his aides were charged with corruption, dealing in black magic and consulting soothsayers. The president remained defiant, but he spent the last two years of his presidency in a much weakened position. After the eight years of Ahmadinejad’s disastrous presidency, Hassan Rouhani’s election marked a return to government of men (and some women) with experience and common sense. Rouhani was an insider, having served for 16 years as the head of Iran’s national security council and also as Iran’s chief negotiator on the nuclear issue. He ran on a platform that emphasized moderation, resolving Iran’s stand-off with the West over its nuclear program, repairing Iran’s relations with its Persian Gulf neighbors, a reversion to sensible economic policies, and less interference by the security agencies in the lives of Iranians. The leaders of the Green Movement remained under house arrest and the leaders of the Khatami era reform movement decided to sit out the 2013 presidential elections. Competing against a field of mostly conservative candidates, Rouhani received 51 per cent of the vote. The runner-up, Tehran mayor Mohammad Bagher Qalibaf, a moderate conservative, received 17 percent of the vote, indicating a preference by voters for a return to the politics of the center. Rouhani’s election also marked a return of reformers to office. Unlike the Khatami team, however, Rouhani aimed not at sweeping reform but at a limited, gradualist approach. As president, Rouhani immediately set about improving relations with the international community. Aided by his foreign minister, Mohammad Javad Zarif, he resumed negotiations with the world’s six major powers —Britain, China, France, Germany, Russia and the United States — on Iran’s nuclear program. He struck a conciliatory tone in his address to the U.N. General Assembly in September 2013. Before leaving New York, he held a telephone conversation with President Obama — a first between an Iranian and American president — in which the two leaders discussed possible areas of future cooperation. (Iran’s supreme leader later described the conversation as “inappropriate,” and no such discussion occurred during Rouhani’s General Assembly trip in the following year). In a sign of the improving environment, the Emir of Kuwait visited Iran in June 2014. Zarif spoke and wrote opinion pieces on possible cooperation with regional and world powers on resolving conflicts like the Syrian civil war. He planned a visit to Saudi Arabia. The rise of the Islamic State, also known as ISIS or ISIL, posed a threat both to the United States and Iran. For a moment, it appeared that the two countries could cooperate in Iraq and Syria against this common enemy. The centerpiece of Rouhani’s policy was a resolution of the nuclear issue. He and his team believed that once the nuclear issue was addressed, sanctions would be lifted, economic activity would pick up, foreign investment would flow in, and Iran could begin to integrate itself further into the international community. Negotiations with the world’s six major powers occupied much of the first two years of Rouhani’s presidency. An interim agreement was reached in November 2013. A target date of November 2014 for a final accord was missed; but a framework was hammered out in April 2015. After marathon negotiations, Iran and the world’s six major powers reached a final deal on July 14, 2015. The landmark agreement – known by its acronym as the JCPOA – or the Joint Comprehensive Plan of Action – included strict limits on the number of operating centrifuges Iran could maintain for 10 years, caps on fuel enrichment and enriched fuel stocks, and redesign of or limits on nuclear facilities at Fordo and Arak to block alternate paths to nuclear weapons. Iran and the International Atomic Energy Agency also agreed on a “roadmap” to account for Iran’s past nuclear activities and allow an intrusive inspections regime. In exchange, Iran is to get phased relief from all nuclear program-related sanctions. In anticipation of the lifting of sanctions, European and American businessmen began to show up in Tehran, looking for future investment opportunities. The Rouhani-Zarif team succeeded, through considerable effort, dexterity and determination, to reach an agreement with the world powers over Iran’s nuclear program; but other sources of tension between Iran and the West remained to be addressed. Iran did not alter its official position that the state of Israel was illegitimate and should not exist. Iran continued to support and arm Hezbollah in Lebanon and groups opposed to Israel in the Gaza Strip. The United States continued to designate Iran as a state sponsor of terrorism. Relations with the Arab Gulf states, led by Saudi Arabia, worsened. In the Syrian civil war, Iran supported President Assad while Saudi Arabia and its allies backed his opponents. The appearance of Hezbollah fighters in Syria (and, on one occasion, an Iranian Revolutionary Guards officer on the Golan Heights) and Iranian arming and training of Shiite militias in Iraq further alarmed the Saudis. Iran and Saudi Arabia also supported opposite sides in the Yemeni civil war. Above all, Saudi Arabia and its Arab allies feared that a nuclear accord would fail to block Iran from acquiring a nuclear weapon and signal American acquiescence to Iran’s growing regional role. At home, Rouhani began the difficult task of addressing economic problems inherited from the Ahmadinejad administration. The slippage in the currency value was halted and the dollar-rial exchange rate was stabilized. Inflation was slowed down. Runaway government spending was slightly curbed. The contraction of the economy was reversed, and by his second year in office the economy began to register modest growth. Rouhani was also publicly critical of the Revolutionary Guards’ large role in the economy. His attempt, however, to ease the high cost of subsidy reform by asking better-off Iranians voluntarily to give-up the monthly stipend available to all Iranians failed; the roll of subsidy recipients began to be cut, moderately and by government fiat, anyway. And midway into his first term, it remained unclear whether Rouhani would find a way of addressing two major economic issues: the monopolistic hold of the Revolutionary Guards, para-statal organizations and privileged individuals over large sectors of the economy and the shaky state of several major banks with large portfolios of non-performing loans. Under Rouhani, there was a palpable easing of social controls and book censorship, and occasionally a vigorous debate took place in the press on major issues of the day. Rouhani himself spoke out on matters of civil and individual rights. With an eye to the activities of the morals police, he said morality could not be imposed with clubs and force. He called for less interference with student activities on university campuses and more open access to the internet. For the president to publicly address these issues was a novelty. But it became clear that, aside from suasion, the president exercised little control over the judiciary or the intelligence ministry. Arrests of dissidents, human rights and women’s rights activists, and human rights lawyers continued. The revolutionary courts continued to issue severe prison sentences for mild political offenses. Despite an implicit campaign pledge, Rouhani was unable to secure the release of Green Movement leaders Mir Hossein Mousavi and Mehdi Karroubi from house arrest. Executions continued at their previous pace. Newspapers continued to be shut down or editors and journalists to be arrested for offending articles. Rouhani was elected to a second term in 2017 by a comfortable margin—a term dominated by the consequences of the Trump Administration’s withdrawal from the JCPOA in May 2018 and the reimposition of a wide range of sanctions. These sanctions sought to curtail Iran’s ability to export oil, ability to conduct business through the international banking system, import and export goods, and attract foreign investment. America’s European allies did not endorse these policies; but along with Russia and China, they were able only to a limited extent to work around sanctions and continue to do business with Iran. The impact of the sanctions on Iran’s economy, already hampered by mismanagement at home, was severe. Iran’s oil exports and revenues dropped sharply. The value of the rial against the American dollar plummeted. Inflation was rapid. International banks grew wary of facilitating Iranian dollar transactions, hampering Iran’s foreign trade; and the sanctions discouraged international firms from pursing projects in Iran. As a result, the foreign investment that Rouhani anticipated would follow the signing of the JCPOA did not materialize. The Trump administration’s effort to encourage the Arab states of the Persian Gulf to join what it hoped to be an international coalition against Iran and its regional activities further exacerbated relations with these countries. The simmering hostility between Iran and Israel escalated into open confrontation along Israel’s borders with Syria and Lebanon. Israel had long warned it would not tolerate an Iranian military presence in Syria. Until 2017, Israel had limited itself to military strikes at Iranian arms shipments headed to Hezbollah in Lebanon. But detecting what Israel claimed were thousands of Iranian-trained Shiite fighters from Pakistan, Afghanistan and Iraq, as well as Iranian military personnel in Syria and along the Syrian-Israel border, Israel began bombing arms depots and military bases in Syria. These military strikes escalated in early 2018. The severe strain in relations with the United States pushed Iran to seek closer ties to Russia and to China. In a rare foreign policy success, Iran, Russia and three other Caspian littoral countries in August 2018 signed an agreement defining the legal status of the Caspian Sea. At home, despite occasional, public criticism of arbitrary arrests and interference with Iranians’ access to the internet, Rouhani made little headway in reigning in the security agencies or curbing the Revolutionary Guards’ expanding role in the economy or—a more recent development—the Guards’ self-assumed role in domestic security matters. Arrests and imprisonment of dissidents and dual nationals by the Guards’ security arm became common. Rouhani’s lack of control over the security agencies was again demonstrated in February 2018 when the French government thwarted a planned bombing of a meeting of an Iranian opposition group in Paris. One Iranian diplomat was arrested in Germany and two in Belgium in connection with the plot. Protests erupted in Mashhad, Iran’s second largest city in December 2017 and spread to other towns. The protests, in which several demonstrators were killed, were attributed to economic discontent and to Rouhani’s failure to deliver on his promises of reform and liberalization, jobs, and improved relations with the international community. Significantly, protestors also denounced the costs of Iran’s involvements in Syria and Lebanon, calling for such monies to be devoted to pressing needs at home. Shaul Bakhash is the Clarence Robinson Professor of History Emeritus at George Mason University. This chapter was originally published in 2010, and is updated as of January 2019.